Rosalina (Melaleuca ericifolia) Rosalina essential oil, also known as “Lavender Tea Tree” is in the Melaleuca family, but is more closely related to Eucalyptus than to Tea Tree. This is a child-friendly oil that has an affinity for respiratory infection & congestion. It is anti-infectious and acts as an expectorant. It is readily absorbed through the skin and mucous membranes, so topical application or inhalation are both found to be effective. Its therapeutic properties include being anti-bacterial, airborne antimicrobial, immune-stimulating, anti-viral & mucolytic. 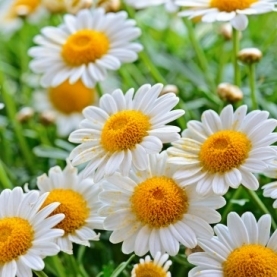 Roman Chamomile (Chamaemelum nobile) Roman chamomile essential oil is regarded as one of the safest oils for children. It has a wide range of uses, from teething & colic to digestive upset, and indigestion. It has anti depressant & sedative properties, is gentle on the skin. It is soothing to the spirit, is calming, sedating & harmonizing. Can be used in a diffuser, inhaler, bath, or in a cream or oil. It has strong antispasmodic properties, which makes it a great oil to use for spasmodic cough and general muscle spasms. Orange (Citrus sinensis) Orange essential oil is a premiere oil for digestive issues. It alleviates abdominal spasms & gas, it helps to reduce constipation, nausea & vomiting. Add to a blend and rub onto the belly for quick relief. It has a fresh, uplifting aroma, so diffusing it helps to bring some brightness to a room and alleviates depression. Antiseptic & antibacterial, antispasmodic & carminative are some of the therapeutic properties of Orange essential oil.